I haven’t posted a recipe in MONTHS. I guess that’s what happens when you have a baby! 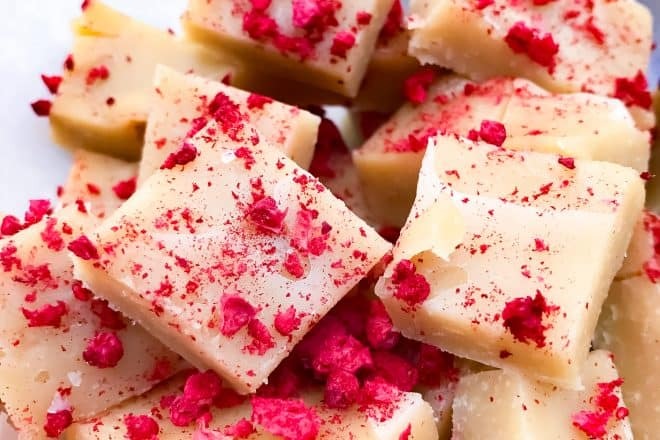 Well, I’m coming back strong with a tasty snack that we’ve been enjoying over the past few weeks – raspberry vanilla fudge bites! I needed something I could grab quickly in between feeding a newborn and playing monster trucks with my 3 year old. Side note- I can’t believe he’s three! We celebrated his birthday a few weeks ago and I have to keep reminding myself I have a 3 year old. I have to keep reminding him too. He still says “two” most of the time when you ask how old he is. And he’s dead set on me being three years old. I’m like um, close, but not really. These fudge bites are gluten free, paleo, and vegan! I’m always trying to look out for my friends on special diets. Even if you don’t have to eat gluten free or dairy free, you will still love these everyday treats. The freeze dried raspberries are SO GOOD in these and I highly recommend getting some from Trader Joe’s! They sell them at Whole Foods too, but they’re probably double the price. I keep wanting to write, “try them, try them, and you may! Try them and you may, I say!” We’ve been reading Green Eggs and Ham a lot over here lately, clearly. But seriously, try them! They’re the perfect thing to nibble on after lunch or dinner when you just need a bite of something sweet. Or if you are constantly starving like I am these days, grab one every time you walk by the freezer! There’s no baking involved, and after they harden you just slice them up and pop ’em in the freezer. Their texture is best straight from the freezer so I wouldn’t recommend keeping them out long before eating. A healthier take on fudge made for everyday snacking. Creamy, sweet, and satisfying! Add cashews to food processor and grind for a couple minutes, until a nut butter forms. Add coconut butter, vanilla, maple syrup, and tiny pinch of salt to food processor. Run the processor until all ingredients are combined well. Pour onto parchment paper on small sheet pan or baking dish. Spread evenly, about 1/2 inch thick. Crush freeze dried raspberries and sprinkle evenly over the top. Refrigerate or freeze for about an hour until firm. Slice into small squares. Store in a tupperware container in the freezer.